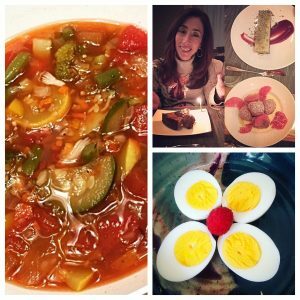 In January, I found an easy, healthy, and delicious vegetable soup recipe. This dish made for the perfect lunch or dinner on cold winter days and nights. I would have loved a bowl of this as I toughed it out through Vermont’s arctic temperatures. My birthday falls in February, and Hubby took me to a restaurant we’d both been dying to try—Chef and the Farmer, which is featured on the PBS television show A Chef’s Life. Our meal was fantastic in every way—service, ambiance, and of course, the food! My picture features our desserts. I have a sweet tooth and no way was I going to miss hopping on board this confectionery flight of three. March celebrated my love of eggs and I arranged these hard-boiled beauties like a spring flower, because, well, March and spring. Confession: Sometimes I like to play with my food as much as I like to eat it. April featured a trip to Hamburg, Germany with Hubby. Imagine, me on a sunny afternoon, tucked in at café table along the Elbe, chest and soul warmed by strong coffee, and melting in my mouth were the mingled flavors of flaky dough, buttery crumble, apples, and raspberries. The whole of it was divine. The month of May featured my favorite harvest kale salad from B. Good, my simple I-don’t-feel-like-cooking go-to dinner. My June choice is rooted in an iconic dish—Buffalo wings at Duff’s in Buffalo. Sauce choices range from mild to death. Duff’s is a must visit if you find yourself in that part of upstate New York. And I just discovered that they ship nationwide! 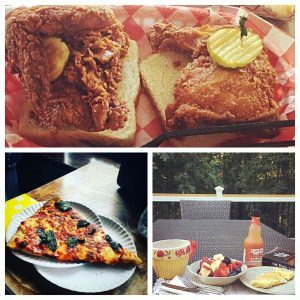 Speaking of iconic foods that are hot and spicy, my hands-down July favorite was the hot chicken at Hattie B’s in Nashville. Hubby and I were in town for an English soccer match and we waited in the lunch line outside Hattie B’s for over an hour and a half. Was it worth it? Absolutely! The chicken was hot, crunchy, tender, delicious, and worth the wait! Friends have since told us how when they were in Nashville, they ate at Hattie B’s multiple times—even twice in one day! Time to talk about August before I use up my supply of exclamation marks. The next picture captures my usual breakfast: two over-easy eggs, a big bowl of fruit, and coffee. I love breakfast. It’s my favorite meal of the day. This particular breakfast was special, because I ate it alfresco on my new deck. September took me to Manhattan and Brooklyn for book research. And since a writer’s gotta eat, too, I stopped in for a slice at Artichoke Basille’s Pizza in Brooklyn. Yum! I love NY pizza! Apple picking with the family at Shelburne Orchard in Vermont provided this bountiful lunch in October: Honeycrisp and Delicious apples, cider donuts, and a cup of warm apple cider. This was my first-time apple picking, but it won’t be my last! Another first takes the slot for November. Pictured here is my first-ever homemade cherry pie, which I made for Thanksgiving. I was nervous cutting into it and grateful that it tasted as good as it looked. Day-after leftovers for breakfast were just as yummy. My December choice is a nod to my favorite potluck dish. 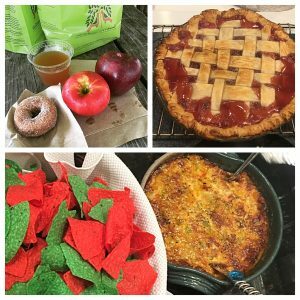 The holiday calendar was full of parties and I brought along my Southwestern Corn Dip. I think the festive red and green chips from A Southern Season made the dish perfect for holiday celebrations. Those are my favorite meals and foods from last year. I’m looking forward to tasting and cooking new dishes in 2018. 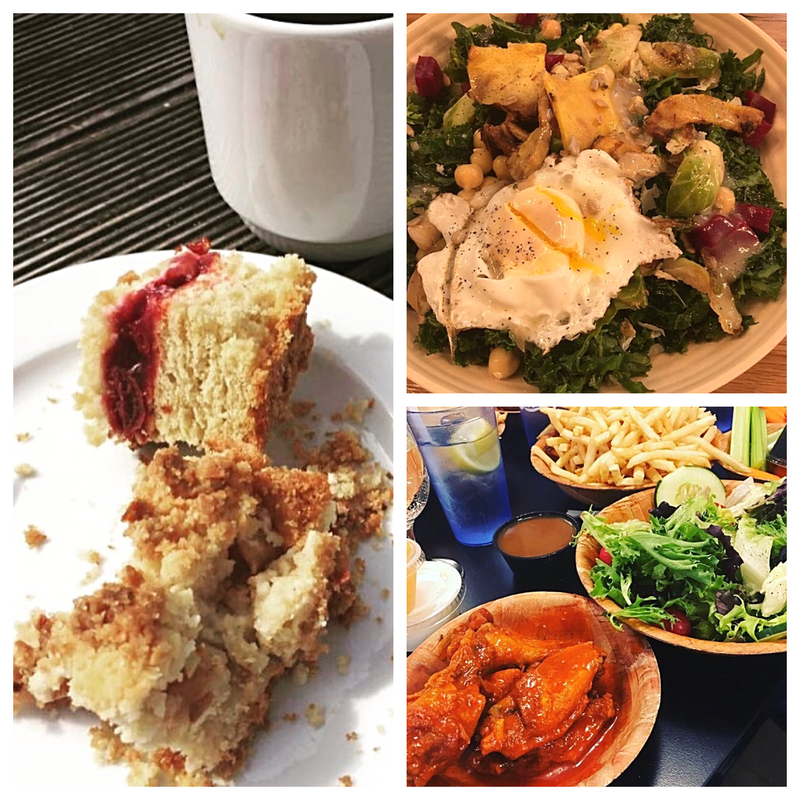 Do you have a favorite food or meal from 2017? Tell me about it in the comments. Yum! Enjoyed the foodie life with you! Thanks for coming along and for reading and commenting! 🙂 Happy 2018! Loved revising the year with you through all this delicious food. 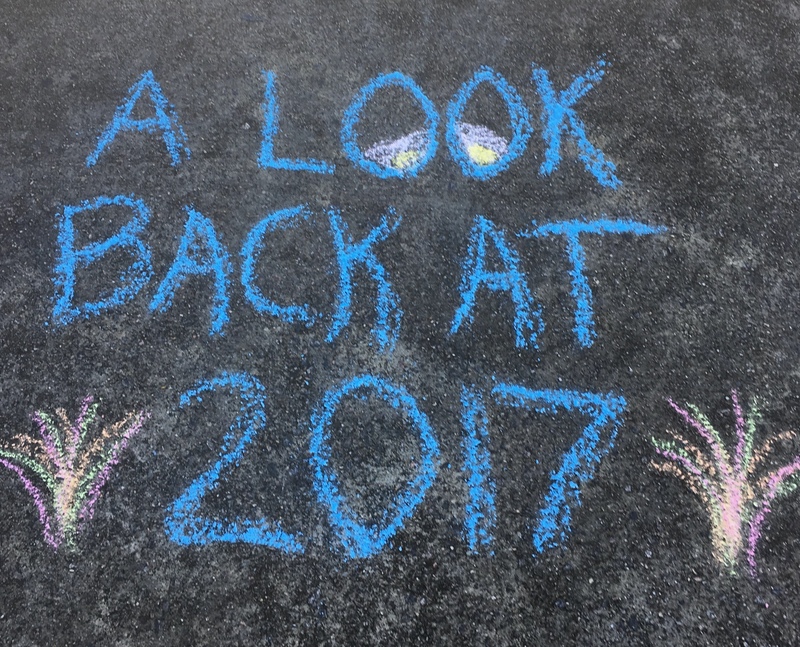 Fun blog!